It sounds–and looks–like something out of a futuristic science fiction movie (and I’m not sure if it would go with my home office decor), but I’d love to try one out. 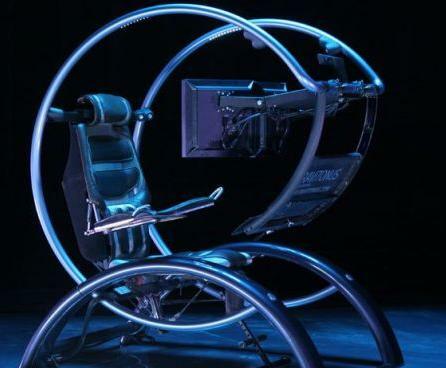 “Created by a group of medical researchers studying spinal cord injury, the Gravitonus ergonomic workstation comes with an on-board computer which constantly analyses body position, measures local temperature and pressure for different body parts and gently rotates the frame accordingly. Currently being adapted for quadriplegics by means of an alternative computer control system (ACCS) which places a control unit in the mouth to do all of the work and allow for breathing, drinking, talking, smoking at the same time.” ~ SafeComputerTips (see the rest of their blog post for a lot of other nifty ergonomic chairs too). Prices for the snazzy computer workstation start at $7,000 (which is actually less than I thought it might be, but I fear I’ll have to stick to my Aeron for now).